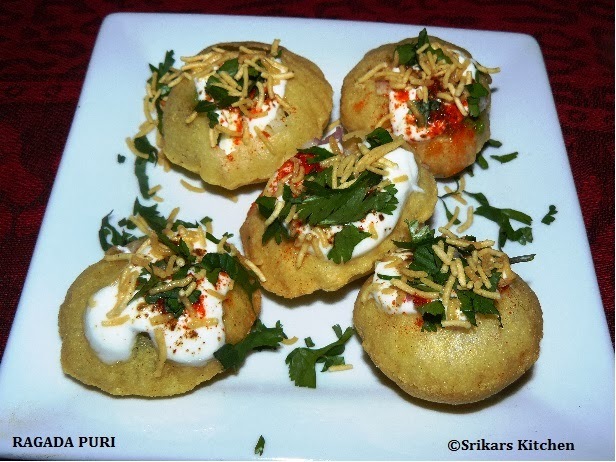 Ragada puri is a one of the famous chat items or indian fastfood . Ragada is made with white peas. Ragada Puri is make with small puris, ragada, spicy chutney, Imli chutneys ,etc.It is very tasty & delicious street food recipe. Take a small bowl add yohurt, sugar,a pinch of salt & mix well. Place all the items in one place. Make the hole on that puris. Add cooked peas, potatoes, tamarind chutney. Add green chat chutney,chopped onion. Add mixed yohurt & roasted cumin seed. Sprinkle red chilli powder .sev, coriander leaves. 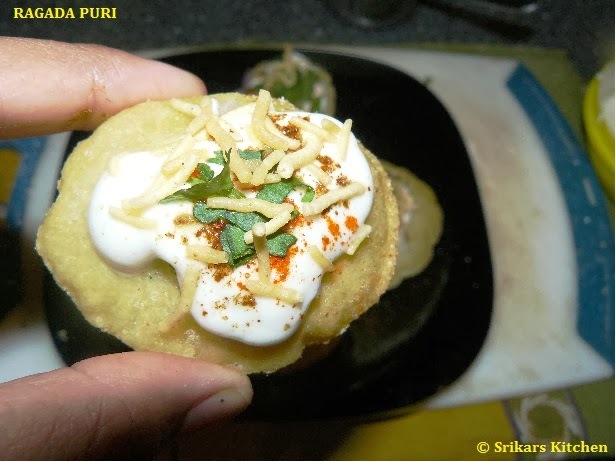 RAGADA PURI- A new name for me. Good to look at. Thanks for sharing. Happy New Year :) looks yummy tasted long time back.tempting.